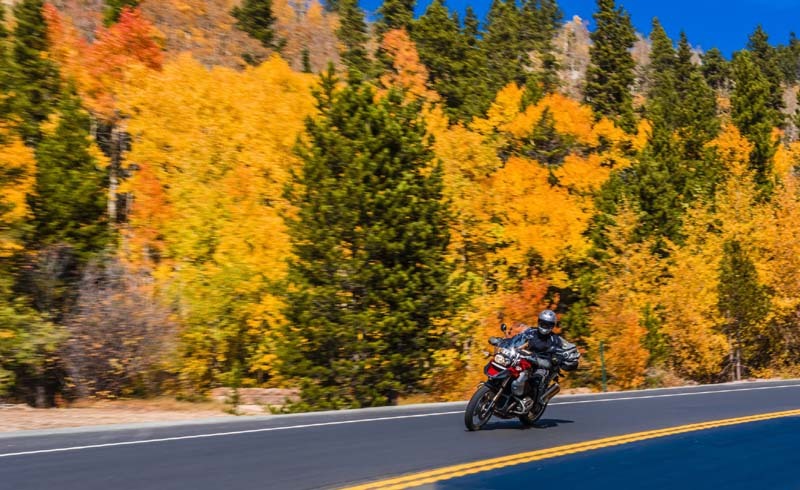 Colorado is home to 26 Scenic and Historic Byways. And while each one is worth a drive for different reasons, one in highway particular rises to the top of the list. The Peak to Peak Scenic Byway is one of the most beautiful drives through Colorado, a must-do if you’re visiting Rocky Mountain National Park and the Front Range. This scenic drive is beautiful year-round, but it’s especially popular in the fall, when the mountains burst into life with the shimmering golden leaves of the changing aspen trees. This route is also historically important. It was established in 1918 as Colorado's first and oldest scenic byway. The Peak to Peak Highway begins as Colo. 7 in Estes Park brings you past the tiny town of Allenspark on Colo. 72, then heads to Nederland. There, it goes south on Colo. 119 through Blackhawk, into Clear Creek Canyon and ends at Interstate 70. This route stretches 55 miles, providing a front row seat to what makes the Front Range so beautiful and special. It’s less than an hour away from Denver and right outside of the college towns of Boulder and Fort Collins, a convenience that adds to its allure. Set aside about two hours for the drive, depending on how many stops you want to make for photos. 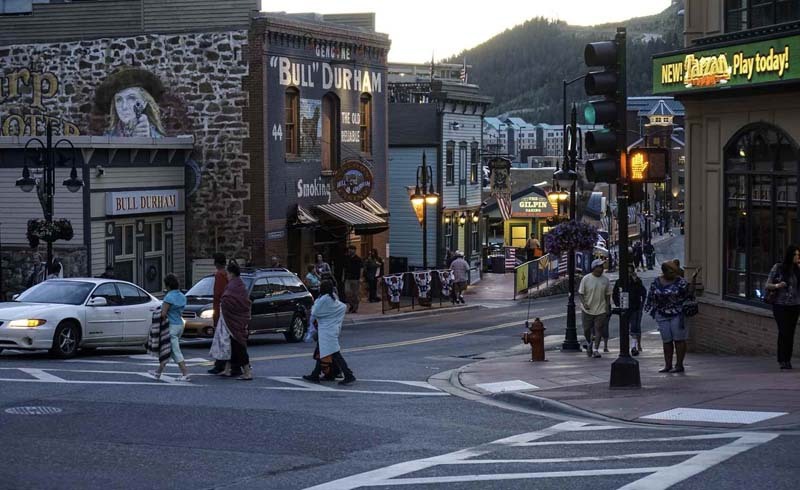 The byway will take you through some of the Front Range’s best mountain towns: Estes Park (with its charming, old-fashioned downtown and bugling elk), Nederland (a quirky town and home to the Carousel of Happiness), and Black Hawk and Central City (both old mining towns turned into casino destinations, previously nicknamed "the richest square mile on earth”). There are so many other highlights along the way that it’s hard to pick which ones to stop at. You’ll find trails, diverting roads to explore, alpine lakes, campgrounds and so much more. It’s like the golden ticket to visit many of Colorado’s hottest spots. The Continental Divide. This is the point on the top of the mountain range that divides the continent, hydrologically. Water runs one direction on one side of the divide and the other direction on the other. It’s a novelty to be able to see that point on the planet. Golden Gate Canyon State Park. Colorado has 41 different state parks that host more than 11 million visitors annually. Check one of the best off your bucket list at the Golden Gate Canyon State Park. This huge park boasts 36 miles of hiking trails, most of which are also open to horses and bikes. To go camping here, choose from more than 100 campsites. This state park has a variety of styles of camping, from rugged, backcountry sites to RV campgrounds with electrical hook-ups and nearby picnic tables. Want a roof over your head? This park has five cabins and two yurts that you can rent, plus guest houses (it was the first Colorado state park to so do). The guest house has four bedrooms, a full kitchen, gas fireplaces, and more (but leave your pups at home). The cabins are open year-round and allow you to surround yourself in nature, without having to forgo the comforts of a bed, toilet, fridge and shower. The park also has various group facilities for family gatherings, weddings, and company getaways. Or just find one of the 100-plus picnic sites to set up a scenic picnic. Arapaho and Roosevelt National Forests. Colorado is an outdoor wonderland, with 11 different national forests, plus two national grasslands. In total, they cover about 14.5 million acres of open space. These national forests, in the Rocky Mountains, are home to a wildlife refuge that protects birds and mammals. In Arapaho National Forest alone, there are six official wilderness areas. What this means for visitors? Lots of wildlife. Head here for great bird-watching (with more than 200 species of birds), including hawks, falcons, and golden eagles. You may also see prairie dogs, jackrabbits, beavers, coyote, red foxes, mink, porcupines, mule deer, elk, moose, raccoon, weasels, badgers, muskrat, and more. Indian Peaks Wilderness Area. Access this area, one of Colorado’s most popular spots, to go hiking and cross-country skiing in the winter, via Nederland. 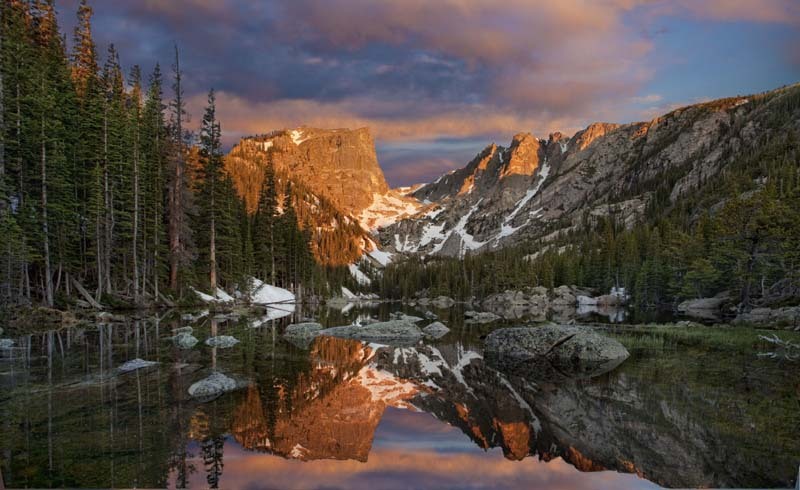 The Indian Peaks Wilderness Area is home to seven tall peaks, although none quite reach 14,000 feet above sea level, qualifying them for “fourteener” status. Indian Peaks is popular for leaf-viewing, hiking on the trails, its beautiful waterfalls, mountaineering, fishing, mountain biking, and camping in the Brainard Lake Campground. This lake can get pretty busy, but that’s because it’s packed with outdoor adventure. Go snowshoeing or cross-country skiing here in the winter. Eldora Ski Resort. Eldora is the closest ski destination to Boulder, just 21 miles away and only a few short miles from Nederland. It’s one of the rare ski spots on the east side of the Continental Divide and a popular destination because it’s close to Denver, but you don’t have to fight the traffic on Interstate 70 to get there. Eldora ski resort is relaxed, approachable, cheaper, family-friendly, and tends to have smaller crowds than some of the bigger ski destinations. It’s a local fave and totally worth the pitstop (or longer) if you're driving the Peak to Peak Scenic Byway in the wintertime. Ghost towns (Hesse, Caribou, and Apex). Whether ghosts actually live in these abandoned mining towns is up to you to believe, you can still see echos of a time long gone in the crumbling, wooden buildings. You may even see people still mining for gold in the creeks, or join yourself with a tour company; there are several mines that let people stop to pan for the bling-bling. It’s not very expensive, and while it’s also unlikely you’re going to strike it rich, it’s entertaining and a way to immerse yourself in nature up to your elbows. Rocky Mountain National Park. This park is one of four national parks in Colorado, ideal for hiking and biking, as well as snowshoeing in the winter. There are no commercial businesses in the park, including no hotels. This park is one of the highest-altitude national parks and home to 60 different mountain peaks, all offering different views and adventures to pursue. There are so many things to do in Rocky Mountain National Park. A highlight is to veer off the Peak to Peak Scenic Byway and onto Trail Ridge Road, which tops 12,000 in altitude, above tree line (that means it’s so high that trees can’t grow here). This has earned Trail Ridge the title of North America’s highest paved through-road. It’s also the highest paved road in any national park in the nation. Rocky Mountain National Park has more than 300 miles of hiking trails. So stop the car, use your legs and explore these mountains. Keep your eyes peeled for wildlife, which abounds here. If you want to see something impressive, there’s a good chance you’ll see some elk (the park estimates there could be as many as 600 elk living within park boundaries) and bighorn sheep (the park thinks there are about 350 of those). Lake Estes. This high-altitude lake (technically, reservoir) in Estes Park is a great place to take hit the water. You can rent a kayak, canoe, paddle boat, stand-up paddleboard, or large pontoon here. Lake Estes is a popular fishing hole. Cast out anywhere on the shores. There are even handicap-accessible fishing spots. You can rent all the gear at the marina; make sure you buy a fishing license, too. After a bit of catch and release, go for an easy hike on the Lake Estes Trail. This paved loop goes around the lake and welcomes dogs and offers bike rentals. The lake isn’t huge, with about four miles of shoreline, but it’s a quintessential attraction in Estes; the views, with the reflecting water and mountains in the background, make it evident why. Bonus: Lake Estes has a wading beach. You can’t go swimming, and you wouldn’t want to in the icy waters of an alpine lake. But you’re welcome to build sand castles and cool off your toes after a long day of hiking before refueling with a picnic at a picnic area. The Central City Opera House. Stop by this intimate, Victorian-era building for some of Colorado’s most legendary opera. This historic venue puts on world-class opera productions and has been doing so since the ‘30s. It is the fifth-oldest professional opera company in the United States. Allenspark and the Chapel on the Rock. The tiny town of Allenspark isn’t exactly a hoppin’ destination, but it’s hard not to stop and gawk at the stunning St. Malo Chapel on the Rock. This small, stone Catholic chapel is open to the public. 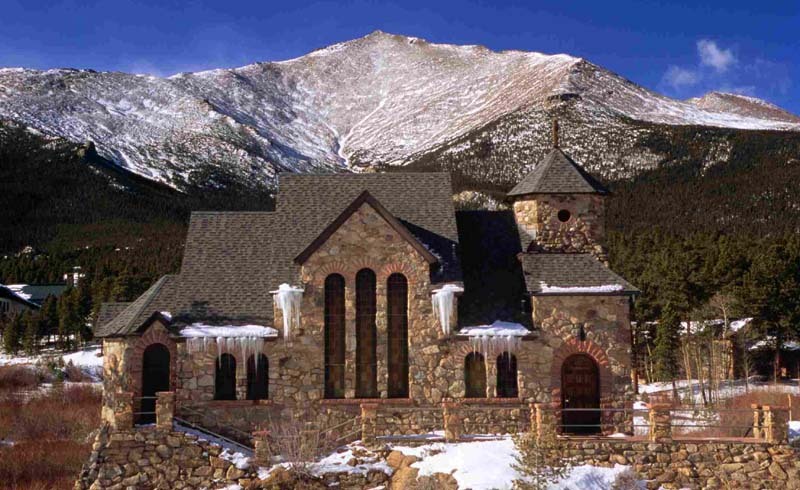 As the legend goes, a religious figure was inspired to build this chapel in 1916, when he ran across a big rock formation not far from Rocky Mountain National Park. He is said to have been inspired by the Biblical phrase “upon this rock I will build my church.” The chapel itself is picturesque and charming. Elk mating. Many elk live in this area. When we say many, we mean it’s almost impossible to cruise through Estes without seeing one or a ton. In the fall, a highlight is to watch (and listen) to the elk’s mating season. That might sound weird to visitors, but it's a common fall-time tradition among the locals. After all, the mating rituals of the elk are fascinating, and the bugling noise is surreal as it echoes off the mountains. 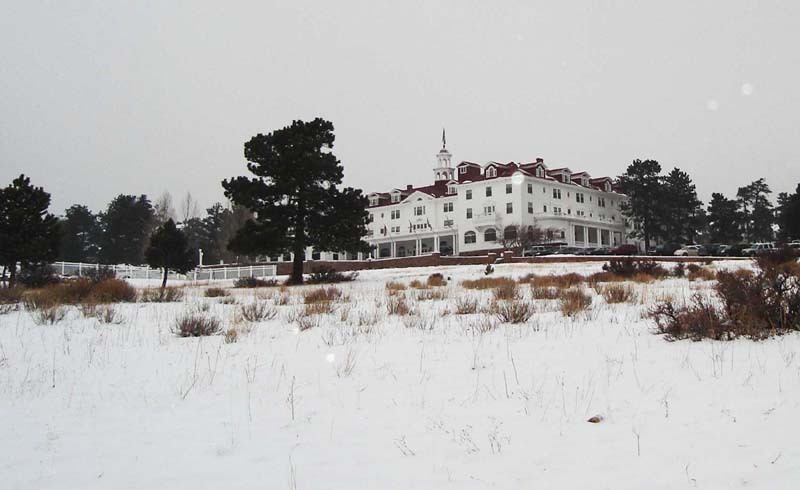 The Stanley Hotel. This is the place to stay if you’re making the Peak to Peak Scenic Byway the centerpiece for a vacation. This glamorous, old, white mansion is perched on the top of a hill above Estes Park. Enjoy the luxury, as well as the history and the lore. Rumor is, the Stanley is haunted. Fact is, author Stephen King was inspired to write “The Shining” when he stayed in the hotel. Join special ghost tours that bring you into dark and mysterious tunnels beneath the hotel. A highlight is the annual "Shining Ball" Halloween party, an elaborate costume party with live music, a costume contest and decorations that make you feel like you've stepped into the horror flick yourself.